Last night the San Francisco Ballet opened its 30th season with Helgi Tomasson at the helm with an onstage toast to his accomplishment: The transformation of a charming regional company into a sophisticated world player in the upper ballet echelon. Not surprisingly the famously reserved Icelander, who began his performing life in Tivoli’s Pantomime Theater before a sterling career in the New York City Ballet, didn’t speak. He didn’t have to. The company’s dancing had just spoken for him. True to form, the evening was more somber and substantial than the usual gala bon bons, though the programming did not neglect to satisfy certain patrons’ sweet teeth, with Tiit Helimets and Yuan Yuan Tan spinning, arms held out like white wings and faces heavenward, in a saccharine excerpt from Helgi Tomasson’s “Caprice” (to swooning Rachmaninoff). But even if helpless ecstasy on sunset beaches isn’t your thing, you had to admire Tan’s earnest execution of the kind of role she is so often asked to sacrifice her entrancingly lithe body to in order to placate the box office gods. I left the opera house struck by how much Tomasson’s ambitions have been aided by Tan’s gracious 20-year presence. She deserves a higher title than “principal,” something on the order of “prima assoluta.” (And she received due deference during the opening “defile” staged by Tomasson, in which everyone from the school’s tiniest students to the most veteran company members presented themselves for grand inspection, with Tan taking the crowning bow.) She is a woman of depth, though much of her repertoire does not allow her to show this. So it was doubly moving to see her as the anguished Tatiana in an excerpt from John Cranko’s “Onegin,” telegraphing with beating fists to Vitor Luiz all her frustration and anger. Covered ankle to wrist in 19th century dress, practically unrecognizable as the company’s lead glamour girl, Tan thrashed with a distress that made her vulnerability her strength. 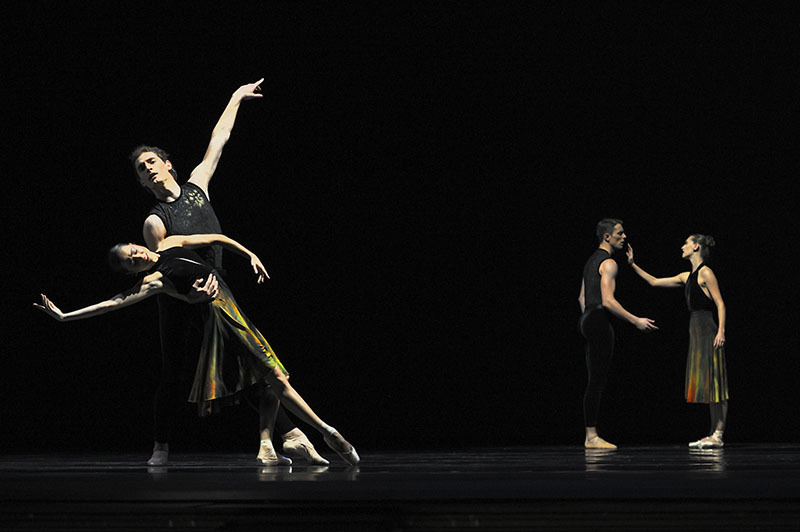 Mathilde Froustey and Carlo Di Lanno (left) and Sarah Van Patten and Luke Ingham in Ratmansky’s “Souvenir D’Un Lien Cher.” Photograph by Erik Tomasson. Tomasson always gives a nod to the future in his galas. In this case, a pride of young lions pawed with stunningly supple feet and lush musicality in Tomasson’s Baroque “Concerto Grosso”: Diego Cruz (much improved in recent seasons), Wei Wang, Francisco Mungamba, Max Cauthorn, and warm-hearted Esteban Hernandez. After the intermission, three up-and-coming women tore through William Forsythe’s cheeky “The Vertiginous Thrill of Exactitude.” I thought Dores Andre, Jennifer Stahl, and particularly Sasha De Sola lived up to the dance’s title; a friend who has observed the company longer than I swears the tempo of the Schubert was not as breakneck as in performances past, and though I do hold memories of superhuman past principals Tina LeBlanc, Kristin Long, Katita Waldo, and Julia Adam burningly in mind, I am confident the young women will in time live up to them. Mungamba and the always-polished Gennadi Nedvigin added their virtuosity to Forsythe’s classicism-on-steroids. The season begins in earnest next week with Balanchine’s “Serenade” on Program 1, and with “Giselle.” In the latter, there are seven—count ‘em seven—casts. I’m particularly interested to see Frances Chung’s debut in the career-benchmark role, and to catch Mathilde Froustey in her second go, after her very touching Act I last season. But Sarah Van Patten, Vanessa Zahorian, Yuan Yuan Tan, and Lorena Feijoo each have special strengths. (Feijoo’s rounded, forward-leaning, Romantic-period-correct arms—learned in Cuba—will make you see the ballet anew.) And Maria Kochetkova’s “Giselle” is one of the greats. You can see the scheduling here.